Prof. Lord Bhikhu Parekh, Professor of Political Philosophy at the University of Westminster stated that Human Rights must include socio-economic rights. He expressed his concern that “rights are being chipped away” by budget cuts, “the war on immigration” and the practice of “stop and search” by British police. We do not have minority rights unlike nations like India or in parts of the Middle East or in South Africa or Canada. Rights here are fundamentally individual rights, enjoyed by minorities as individuals not as a collectivity. 2) Rights are not just civil and political. They are also social and economic rights and they extend to welfare and social benefit and lots of other things. 3) No conceivable situation in which human rights can be denied in Europe because there is an established tradition of respect for human rights. What could happen and is happening is these rights are chipped away little by little. So eventually you can get to a point where the rights are there in form, in rhetoric are respected but do not really amount to much in practice. a) Social and economic rights are of human rights - right to welfare and social security and increasingly this particular Government and also the previous Labour Government, have tried to chip away at the rights of single mothers, disabled and the pensioner etc. b) War on immigration by European Governments. There is a perception that hordes of people coming and settling in Europe. How do we stop them? They are not recognising that immigrants make an enormous contribution but also you cannot arbitrarily stop people from staying here because they have a right to be settled with their family and to marry who they like etc. So in the name of protecting the national interest and social harmony over immigration all kinds of restrictions are being put in place. The ability to restrict who someone bring to the nation. There is a restriction in some nations that anyone who comes should already have mastered the language. In the past there were more sensible rules allowing someone to come and in two years acquire linguistic competence. The recent riots in the UK were partly started by reactions to the stop and search procedure of the Police. In the past it was restricted to the Muslims and if you have a beard like my friend here Imam Sajid, it is quite likely that you are hiding something and you should be stopped and searched. Now or at least in the last 18 months, for reasons I don't fully understand the practice has been extended to Blacks. Afro-Caribbeans. More and more of them than ever before. The assumption being that they are all drug dealers and there is now a war on drugs. It is no longer the war on terror. We are always looking for something to declare a war on. This kind of militaristic mentality requires a target whether it is drugs, prostitution or trafficking. Blacks are involved, or so we are told and therefore stop and search. In 80% of the cases nothing is found. The people are innocent. A superficial search of the body is okay but some are strip searched. You are stripped naked or right up tp your underpants. Then in 75% or so of the cases nothing is found. Now not only are people humiliated because you have subjected them to this indignaty but you make them feel their very presence is a threat. You can't walk around in any society if you are constantly under a cloud. With a result that there are riots. It is utterly unacceptable but nevertheless you create a climate in which people feel the only way to get back at the system is to use violence. d) There is a deep tension about the logic of human rights. There is a strong feeling that human rights are being used to push a secular agenda. Lots of Christians say that there should be no gay marriages, there should be certain restrictions on certain sexual practices. Human rights view would be that I should be as free to marry who I like as anybody else. Gay marriages are equal in status to hetrosexual marriages. Increasingly therefore human rights are not seen by religious people as being acceptable to all cultures or being culturally neutral. Human rights are seen as being used to promote a secular agenda. I don't think they are but there is a feeling when it comes to situations of this kind. We have to be careful of this perception if we want human rights to be perceived as being legitimate. Europe is not a homogenius entity. Britian is not France and France is not Netherlands and the Netherlands is not Italy. Different nations are following different practices. Netherlands was the model of a pluralistic society. It has increasingly become oppressive. France has become more rigid towards minorities. When we approach Europe we must see that the nations are going in divergent directions. We cannot treat Europe in the same way. Prof. Lord Bhikhu Parekh is a fellow of the Royal Society of Arts and of the Academy of the Learned Societies for Social Sciences and a Professor of Political Philosophy at the University of Westminster. 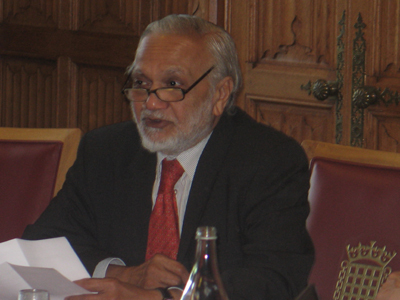 Lord Parekh was chair of the Runnymede Commission on the Future of Multi-Ethnic Britain (1998-2000), whose report, The Future of Multi-Ethnic Britain, was published in 2000. His main academic interests include political philosophy, the history of political thought, social theory, ancient and modern Indian political thought, and the philosophy of ethnic relations. Professor Parekh is the author of Rethinking Multiculturalism: Cultural Diversity and Political Theory (2000); Gandhi (2001); Colonialism, Tradition and Reform (1999); Gandhi's Political Philosophy (1989); Contemporary Political Thinkers (1982); Karl Marx's Theory of Ideology (1981); and Hannah Arendt and the Search for a New Political Philosophy (1981).